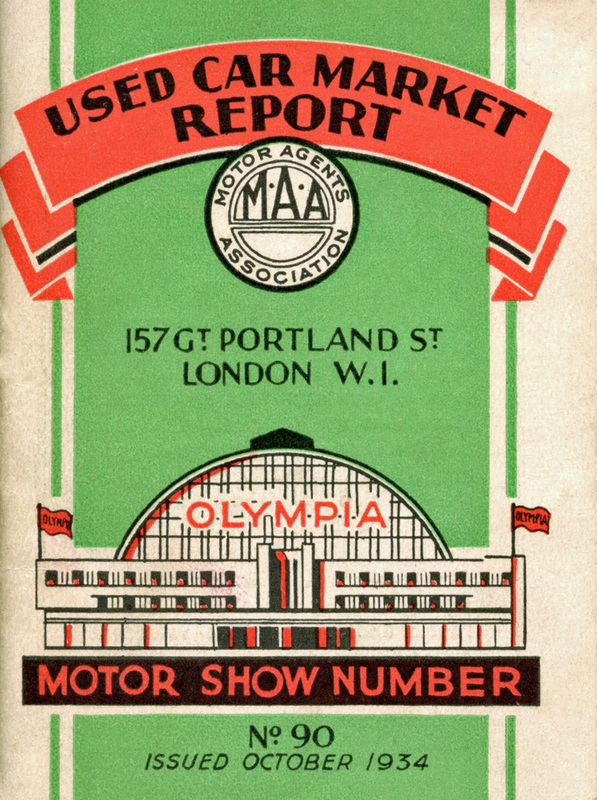 For 32 years the London Motor Show was held each October at Olympia, W14 before eventually moving to the newly constructed Earls Court, SW5 in 1937. The show was a huge event in the motoring calendar with all major manufacturers (bar Ford) exhibiting. The three main motoring magazines produced a series of mammoth Motor Show special editions throughout the month of October, all crammed with advertisements, reports and photographs. For the visitor , the show programme was a gargantuan, almost 500 page tome, while the cover of the publication pictured here was perhaps the most diminuitive at 4″x3″ and just 30 pages. If you wanted to know how much your 1930 Minor Coachbuilt Saloon was worth then this booklet contained the information, in much the same way that a similar sized edition of Glass’s Guide (launched 1933) would.